DESCRIPTION At the right time of year, from this legendary 15-mile long white strip of sand separating the deep blue Bahamian waters from the shallow bank of Gun Cay, you can spy tons of Bluefin tuna, migrating north. And with these bad boys on, with their integral hinges, patented vented system and tough-as-nails nylon material, you won't miss many. C-MATES Sunglass Readers: News worth reading about sunglass readers: the lenses that help you see the small stuff- from tying a fly to reading a map- will no longer have a visible line around the front of the bifocal area. You can also now get them in the superior 580 technology you've come to expect from Costa sunglasses. Many new styles are available for 2015, and we've added a third power range of +2.00 that fits in nicely between the +1.50 and the +2.50. FEATURES Comfortable large fit. Integral hinge. Heavy-duty TR 90 nylon frame. Includes hard case. 100% UV light blockage for max protection. 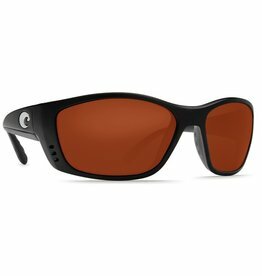 100% polarization kills reflected glare and reduces eye strain. Built by hand and backed for life. Every pair of Costas include a lifetime warranty. Plastic lenses are lightweight, impact- and scratch-resistant.